HTC's last QWERTY keyboard phone was a well specced hulk of a thing that could fill any pocket. The HTC S740 is a much slimmer, more svelte affair, measuring just 43mm across, which somehow makes its 17mm depth feel like less than it really is. 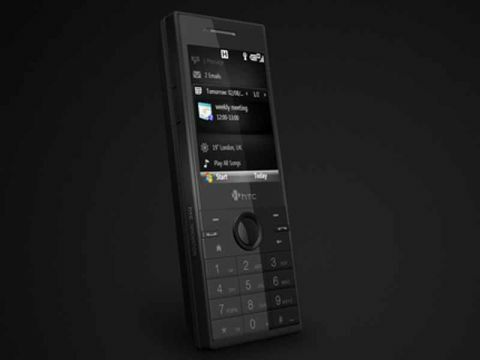 It's not HTC's best looking handset, bearing a passing resemblance to a cordless home phone with its boxy shape, though the reflective front has a certain style and the rubberised plastic back, with similar angular styling to the HTC Touch Diamond, feels classy as well as practical. The screen, which isn't touch-sensitive unlike other recent models from HTC, is 2.4in and offers QVGA resolution – not the best but certainly fine for a screen this size. Below it are a circular D-pad surrounded by two soft keys, call start/stop buttons and home and back keys. The numerical keypad is well-spaced though the keys are flat and not easily distinguished under the thumb. Around the sides are volume buttons and a camera shutter button, something not usually found on HTC devices. Unusually, the SIM card and microSD memory card reside together in a small compartment revealed when the keyboard is opened. You have to remove the SIM to get to the memory card, which is a nuisance if you're likely to swap your memory cards regularly. As with other HTC smart phones, this is a Windows Mobile handset, though the OS is relegated to the background by HTC's nifty-looking 'sliding panels' interface, which presents the most popular apps with some fancy graphics. But the star of this particular show is the slide-out QWERTY keyboard, which is a mini marvel. It has four rows of keys (the Touch Pro has five) so you'll need to press the FN key to get the numbers, but that's no hardship. There are direction keys, two soft keys and shortcuts for email and text message applications. The keys are of rubberised plastic and are raised in the middle, making them very easy to find under your thumbs when you're texting, emailing or instant messaging. Snapping out the keyboard automatically realigns the screen into landscape mode, which offers the best resolution for viewing web pages (something several recent Touch models have lacked the ability to do). Browsing the web is a breeze using the D-pad to move around pages and the keyboard to input info. The zoom control is a bit basic, in that it only offers on or off, without any increments, though there is also the option to fit pages to the screen size or to rearrange the page into a single column. There are RSS feeds and web access isn't a problem with the S740's fast 3G HSDPA (up to 7Mbps download) connection as well as Wi-Fi if you need broadband. The 3.2 megapixel camera is better than most we've tried on other HTC devices. It's very quick to start up (a little under two seconds), making it ideal for quick snaps. There's no flash or autofocus but pictures in good light held a fair amount of detail, even if the colours tended to look a little washed out. Any movement tended to blur all too easily however, as it did with video. The panorama feature is a good one, allowing you to take three photos with each lightly superimposed on the next to help you build up a panoramic image. HTC's Audio Manager music player displays cover art where available and includes a ten-band graphic equaliser, which you can adjust manually or via the 21 presets. There's also an FM radio on board with nine channel presets for which you'll need to add the supplied headphones, though you can also listen via the built-in loudspeaker. The headphone sound isn't great, sounding 'shut-in' and without much bass – unfortunately you'll need a USB adaptor to be able to add a better pair of 'phones. A-GPS is on board supported by Google Maps, and didn't have any trouble finding our north London bolthole. This being a Windows Mobile handset there are lots of other map and sat-nav options you can add (for a price) though a screen with these modest dimensions wouldn't be ideal for an in-car sat-nav. Windows Office is on board too, though unlike other recent HTC models it's the basic version which allows you to view or edit Word, Excel and PowerPoint documents but not create them. It's not the best looking handset in HTC's range, but it has one of the best slide-out QWERTY keyboards we've used, a good browser, fine music player, half-decent 3.2 megapixel camera, A-GPS and the versatility of Windows Mobile, all in a slim, pocket-friendly package.